Shortly after I fell in love with NetworkNewsWire, I learned to love Newsgator for no other reason than so I don’t have to read the same news twice. The biggest thing I had to give up when I got my iPhone was Newsgator Go! I have been using the mobile version of Newsgator.com on my iPhone and while it’s ok, anyone who has used it knows it doesn’t work that great on the iPhone. Now Newsgator has released a iPhone optimized version and I have to say they’ve done a great job. It’s really nice! Now if I could just get an equivalent to Google’s mail application, all would be right with the iPhone. Why does the iPhone take so long to sync? I have had a few devices that I’ve sync’d with my computer and it seems that the iPhone is the slowest of them all. It takes 7 minutes to sync everything but media. Then it only takes 2 minutes to sync my podcasts. Maybe it’s just me, but 9 minutes to sync — not including video or music — is too long, especially considering the amount of changes that were made. **Update** The reason for my long sync was Office 2004, once I updated to the preview of Office 2008, my iPhone syncs really fast! **2.0 Update** The first few times I synced after updating to 2.0 took forever, but just keep syncing, and eventually the “backing up iPhone” flys by like it did before. The problem is the applications — every time you add new apps it has to back those up which takes forever and for whatever reason it seems to take longer when I install the apps via iTunes than when I use the iPhone’s app store. Two of my favorite things work terrible together. Gmail is the best web mail application, I can’t imagine email without it, but the lack of IMAP is a real bummer. POP has always sucked when used to keep up with your mail in more than one place, and Gmail manages to make it worse by; not giving you enough control over what gets POP’d, not marking items as read when POP’d, and putting sent items in your inbox. So until Apple and Google get together to make a Google mail equivalent to Goog’s Java app, here is the work around I use. First you need a good IMAP service provider, since just about everyone has an AIM account, just login to mail.aol.com and configure your mail. Then go to Gmail and create a filter that will forward just the mail you want to receive on your iPhone, to your AOL email address. Now from either Mail.app or directly from the iPhone, configure a new email account. Call it GMail and configure it just like Google instructs, but instead of using their POP server, use AOL’s IMAP (imap.aol.com) server (be sure to use Gmail’s SMTP server though). If you set it up in Mail.app and sync over, you’ll have to edit the SMTP settings on the iPhone manually, cause the settings don’t sync over correctly — it should be obvious what the problem is, just don’t forget the special port number. The only down side of this method is that you have to mark any email that makes it to your iPhone as read twice. But the good part is that you can send messages from your iPhone that not only appear to come from your Gmail account, but they also show up on gmail.com as if you’d sent them from the website. If you’re wondering why I just didn’t use Yahoo’s IMAP service, it’s cause the iPhone won’t let you configure a different SMTP server on an Yahoo account or a different from address. I thought about configuring the account manually, but I couldn’t figure out the settings. I even tried to sniff my iPhone’s traffic while it retrieved my Yahoo mail, I figured out the IMAP server IP, but I was not able to figure out the user name or the password since they were encrypted (I tried the ID and password I use to sign on to yahoo.com, no dice). If you know how to brute-force this let me know, I still have the TCP stream. **Update** Yeah, Gmail adds IMAP support, so no more work arounds! But you can still use this if you want to make gmail push mail via Mobile Me. My friends Ryan and Chris at Engadget have written the most comprehensive iPhone review you could imagine. It it 13k words, so you may want to take it in short segments. Also here’s a mini review from yours truly. UI is fantastic, fast and couldn’t ask for anything more. iPod, phone and photos functionality is fantastic. www.apple.com/trailers/iphone is a great example of a great iPhone web application. WiFi integration is unbelievable, it really does just work. I love Gmail and like the review says “One Engadget editor called the Gmail integration “a crime against humanity”. Email in general is really bad. Safari crashes and it doesn’t identify itself as a mobile browser, so it always tries to load the full page, which can be painful over Edge. 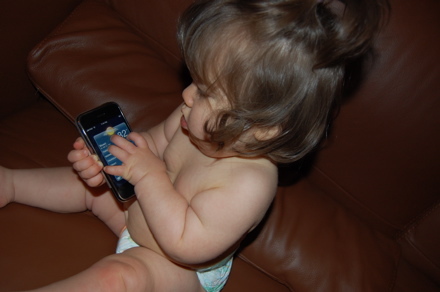 The iPhone is the best phone I’ve ever had, hands down, but I can’t wait for software updates to resolve the issues. I had tons of fun waiting in line for my iPhone — good thing since it wasn’t necessary to wait — and when they finally opened the doors, I was right up front taking pictures for Engadget’s live line coverage. 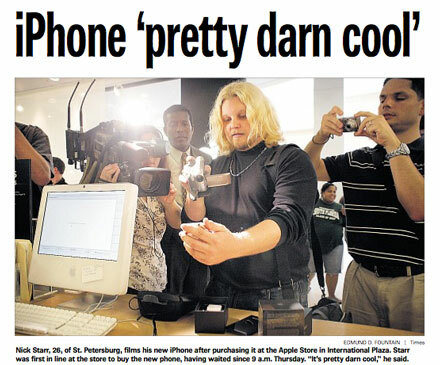 In the process, I was standing behind the #1 iPhone customer (that’s me to the right) when the St Petersburg times took the picture for the front page of the Saturday June 30th edition. Definitely a fun experience.